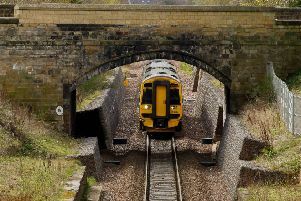 A train bound for Edinburgh Waverley pulls into Newtongrange Station. Further calls have been made to extend the Borders Railway, at a meeting of the group which fought for the return of the line. At the recent AGM for the Campaign for Borders Rail in Hawick, Rachael Hamilton MSP (Con) called for an extension to go through Hawick to Carlisle. These views were echoed by John Lamont MP (Con) when lobbying the UK Government to extend the Edinburgh to Tweebank line. The AGM saw a panel of politicians from the Borders as well as Scotrail managing director Alex Hynes discuss an extension to the Borders Railway. Also at the meeting the group’s membership voted to continue to campaign for the extension of the railway to Hawick and onto Carlisle.